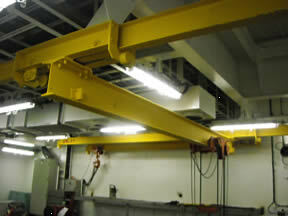 Manual, Air , Hydraulic or Electric powered, these chain hoist can work wherever you do. 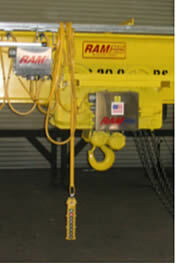 Available right out of the box or with custom features like Spark Resistant materials of construction and special corrosion resistant paint, RAM’s Chain Hoists are the right fit for your application. Furnished in either Top Hook Mount, or Lug Mounted to plain, hand geared or motorized trolleys , these hoist are capable of meeting the envelop space requirements necessary to fit just about anywhere lifting gear is required. For those maintenance and operations applications that require very low headroom, RAM can provide beam specific, integral trolley hoists that can fit into exceptionally tight spaces. The length of lift or reach is variable and the hoists can be furnished with optional chain containers to prevent the unused chain from getting in the operators way. Curved Monorails and Switches are not a problem as our hoists are available in a range of turning radius and swivel trolley configurations. Available for Monorail and Bridge Crane Applications, RAM can provide all manner of accessories such a parking brakes, travel locking pins, rack & pinion drives as well as power supply festooning systems compatible with your environment and available space.